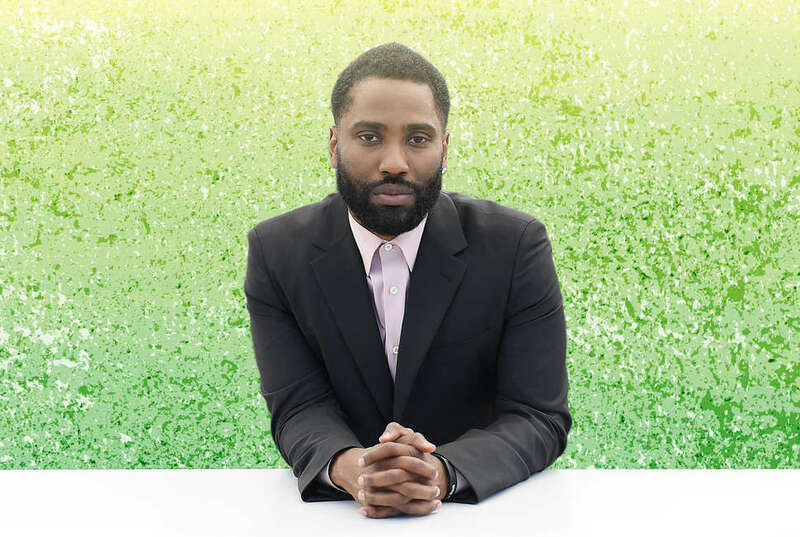 John David Washington first appeared in a Spike Lee movie when he was just a little kid. At the very end of Malcolm X -- which stars his father, Denzel -- he stands up and declares, "I'm Malcolm X." He is one of a number of children who do so in Lee's conclusion to the epically scaled biography, one that zooms out of the Civil Rights activist’s life and into a modern Harlem classroom at its end. Now, 26 years later, the younger Washington is the lead in another real-life drama from the director. 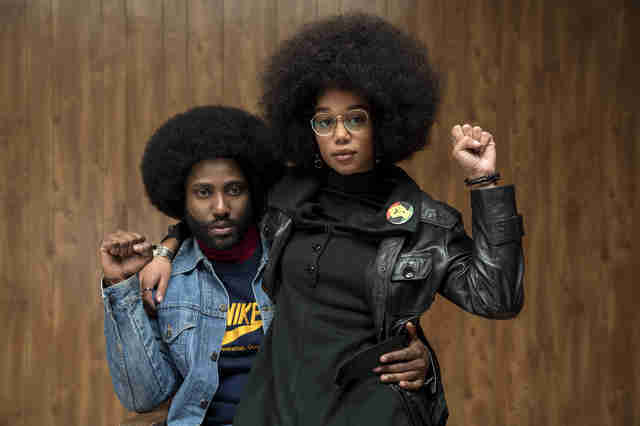 It's BlacKkKlansman, the surreal story of Ron Stallworth, a black detective in Colorado Springs who became a member of the KKK during an undercover investigation. Wait, how? 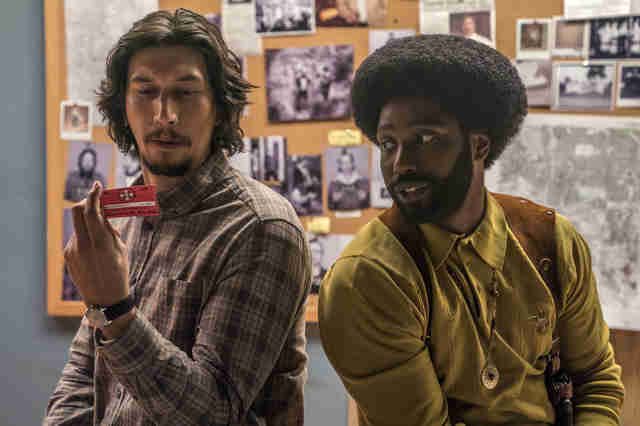 In Lee's film, we see how Stallworth chats up members of the hate group -- including David Duke (Topher Grace) -- on the phone, endearing himself to them, before sending in another, white officer to their meetings (Adam Driver). As Stallworth, Washington both grimly endures the racist vitriol and finds perverse humor in essentially pulling off the ultimate prank. See, for instance, the scene in which he comes face to face with Duke -- and gets him to pose for a photo. And while it’s not his debut -- Washington, who was in the NFL, also appears on HBO’s Ballers -- BlacKkKlansman suggests that the 34-year-old can go toe-to-toe with the greatest living actors, including his dad. Thrillist: I believe your very first credit is as one of the little kids at the end of Malcolm X saying, "I am Malcolm X." 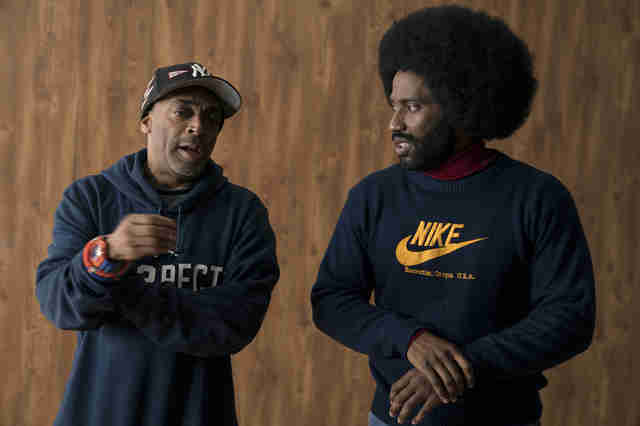 What are your memories of Spike Lee, your dad, and being on that set? John David Washington: I remember my father came home once and dyed his hair red. I was like, "What happened?" I was almost emotional about it. "Let's go get them. Who did this to you?" He was obviously getting into character. That was a whole process he was doing. But that day, that shoot I didn't even know I was going to be working that day. I think Spike just asked me if I wanted to do it. I was like, "Heck yeah." Whatever "heck yeah" sounds like as a kid. We did it seven times. He kept saying, "Calm down. Listen to Uncle Spike." I was a kind of hyper kid. But I was excited. I was just there and I got to say something. So if you can wait two and a half hours in the film, you can see one of the strongest performances you'll ever see. I think it's three and a half hours. Washington: Yeah, you might be right. I was lying. It was three. Washington: That’s right. That's what he said to call him. Listen to Uncle Spike. Was that the first time you met him, or did you know him before? Washington: I want to say he knew me. But those were my first memories of him. Was that one of the moments you got the acting bug? Your path is a little circuitous. Washington: It definitely happened through trial and error and that being these injuries I experienced that kind of got me into it. But it was before that. I wanted to act since I was like 5, 4 years old when I saw my father do Shakespeare in the Park. He did Richard III. I remember walking with him around the city. "Now is the winter of our discontent." He would say those lines all the time and I loved it. Then the movie Glory. All I wanted for Christmas were those blue suits the soldiers got to wear. I knew every line that every character in that film said. The bug was there then. What was your relationship with Spike from then to now? Washington: Like family once a year during holidays or maybe like a gathering. We didn't talk every day or anything like that. So my surprise, when I got the role I got a text from him. And I don't really get texts from him like ever. That was crazy. My brother had worked for him on She's Gotta Have It as well, so that's how he got my number. He said, "This is Spike. Call me." I called him and he told me about this project a little bit. Not in great detail. He was just like, "I’ve got this crazy [story]. First black detective in Colorado Springs infiltrates the [KKK]." I was like, "Yeah, right this is like a Dave Chappelle skit." He sent me the book. I read the book. I went berserk. I couldn't believe it. I told him, "This is great. This is fantastic. Y'all are really doing this?" And he said, "See you this summer." Going back a little bit, can you talk about the football injuries that led you to acting? Washington: I tore my Achilles. I was at a [training session] and I tore my Achilles and that sort of ended my career. A great friend of mine who is like family to me, who is my representation, said to go in and read for a TV show about football players. I couldn't believe it and I got it. It took 10 auditions, but I did get it. What was your family's reaction when your football career ended and you went into acting? Washington: Nobody in my family was surprised, but I also kept it a secret except for my mother. My mother helped me on every audition. We'd read together and she was basically coaching me up. That was fun. I loved that she got me the job. I was literally in crutches and a boot still recovering on pain meds on my first two auditions. So she drove me and I had to crawl up the stairs. It was crazy. The audition was great, it worked out. I'm not saying you should be on pain medication when you audition. I would never do that. But it just happened that time. I guess I was really relaxed and went for it. I also went in there knowing, you’re probably not going to get this. My agent said, "You're not going to get the job, it's just good experience on auditioning and learn what failure feels like in this industry." I know what it feels like in the NFL, all the time, so I was kind of impervious to that. But once it started to catch on, I got the momentum. I could really do this. What happened too was I had really wanted to do this. I’d been wanting to do it my whole life, I was hiding it. I came out, and it just happened and it's a beautiful thing. And here I am now. So you read with your mom. Do you ever read or practice for auditions with your dad? Washington: No. Too much pressure. What other preparation other than reading the book did you do for BlacKkKlansman? I read that you met with the real Ron Stallworth. Washington: I did. I got to meet with him once production started. It was more than that, too. Months before meeting him, I reached out to my uncles. I put together a sick playlist, nothing but late '60s and '70s music. I went to sleep to that and Soul Train every night. I had Super Fly on repeat. Love that film. I was just getting different stories from my uncles about Vietnam and experiences of being a black, African-American male in the '70s and those times. All that helped before I got to talk to Ron and get specific to his story. That was the canvas I wanted to paint on. I needed to know what it was like in those times. Obviously, I did my research through documentaries. There's a great one called Black Power Mixtape that's fantastic. CNN has these '70s documentaries. What did you learn from Ron that you filtered into the performance? Washington: When he handed his card, his Ku Klux Klan card, and when we saw that he is an actual member of the Ku Klux Klan. When I’m holding the card I couldn’t believe this. This dude did that. It brought it all home. How diligent he was. I got the information tactically on how he approached the case and all that. And what it's like to be a cop, like where to stand, know where your exits are. All that kind of stuff too. And that’s cool stuff and I needed it, but we also got under the surface, what it's like being an African-American male in Colorado Springs and the kind of pressure to even make it before even becoming a detective. What motivated him to want to protect and serve. All of that stuff. What was it like having to vocalize this hate that Ron had to spew in order to infiltrate the KKK? Did he talk about that? Washington: He said, to do his job successfully, to infiltrate that kind of hate in that organization, there were trigger words that he had to use. So there's a certain vernacular, a lexicon of hate that is recognizable [for them] to accept him. Because he had the advantage of them not seeing him, they didn't have the aesthetic of this man, they just heard his voice. He used that to his advantage. So for me as an actor, I knew once I got that perspective, I knew you’ve got to bury your emotions a little bit to do that kind of job anyway. You have to be as tactical as possible. You have to be a bit more pragmatic and instinctual until certain instances come up that you have to think on your feet. That’s kind of like what he had to do too. It was like a combination of such things. The challenge made it fun as an artist, as an actor to do that, but also I believed, just like he believed in what he had to do in his mission. I have to use these words to infiltrate, to get in. He said it's like being an actor. He had to get into the role himself. Spike really wanted to get the film out around the anniversary of the deadly white supremacist rally in Charlottesville. Did that breed an urgency on set? Washington: That's a good question. Being on set, it's a hurry up and wait kind of a lifestyle. But the environment was such one of teamwork, of familiarity, of people that just wanted to be there. It seemed like everybody believed in what we were doing. It wasn't the whole, this is going to be a hit. It wasn’t that kind of language. It was more about, we're getting to tell this big piece of American history that's not well-known, that's not mainstream until this movie is released. So everybody was motivated. That's Spike setting the tone on set. So urgency, maybe. Some days we'd only shoot two scenes, others we'd shoot like five. You’ve just got to be ready at all times. But I didn't feel it. I've been on sets where you feel that urgency. We've got to get it, we've got to get it. But at the same time there was a pace that you had to keep up with it. What about the bigger picture of what you're doing? Because of the fact that Spike added footage of Charlottesville at the end, because of the real-world relevance, did that put any pressure on? Washington: I definitely didn't think that going in. I can’t think about what kind of impact or what movie this is going to be. I had to focus on the work at hand. I had a lot of work to do just getting the story right. Not even right, but true, the truest I can tell it. And again because of the environment being set by Spike Lee, by Jordan Peele. We have master storytellers at the helm, running the show it made it that much more comfortable. I guess it rid the pressure feeling because everybody's on the same page and welcomes whatever you interpret. Whatever you create. What do you think about the discussions between Ron and his love interest Patrice, the student activist played by Laura Harrier? Ron believes you can fix the world from within the system; Patrice disagrees. The conversations are messy, they're fascinating, there is no clear answer, which is Spike's M.O. in a lot of ways. Washington: It's how he packages and delivers messages. In this film, he's not teaching, he's not like on Barney, "See America, we've got to change. Wake up." None of that. He's just laying out the story, which I love. That takes a lot of trust and faith in the story we're telling, and the actors to not try to manipulate certain messages. I feel like we're not holding the audience's hand in this. We're just really telling the story how it happened and you can decide it for yourself. We start the conversation. But I love the relationship between me and Patrice. Laura, God bless her, she captured this college student with a cause so perfectly. It was so clear. Not only did he just like the girl, he ends up loving her. He was drawn to her passion. He has the same passion, they just speak in a different language, if you will. Going all the way back to the beginning: You were so young when you were first directed by Spike Lee. Were there similarities in his directorial style between then and now? Washington: No, because I'm older. I'm the one that changed. He's been as consistent as can be. I'm the one that changed. Wise men tell me there's no such thing as small roles, only small actors. So I was like, that role was just as important as Ron Stallworth to me. We didn't really discuss it too much when we were shooting, obviously. This was a whole different thing. That was the '90s, for crying out loud. The industry was in a different space then, too, and they were making history back then with that film. It was just like, "Good to see you again. Let's make a movie." Esther Zuckerman is a senior entertainment writer at Thrillist. Follow her on Twitter @ezwrites.